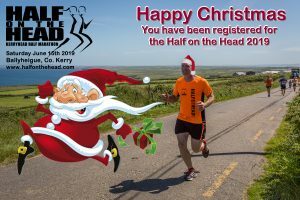 Why not buy your friend or loved one the perfect Christmas Gift by entering them for next years Half on the Head (or 10km run). Not only will you be getting our special early bird price which ends in January but we will also send you a free e-gift card that you can give to the lucky recipient. 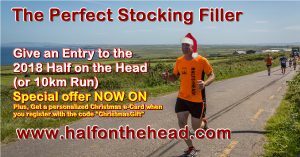 Simply register using the code: ChristmasGift but remember to put in your e-mail so that we can send the notification and e-card to you. We can always change it afterwards.